We often hear the term “going the extra mile” in reference to memorable customer service experiences. While we all have a vague understanding of what is meant by the term, most of us struggle to define what the extra mile in customer service actually is. And because we haven’t clearly defined it, how can we actually achieve it? Customer service training can do a lot of great things. It can help people master critical communication skills. It can help people improve their mindsets, their ability to connect and build trust and relationships. 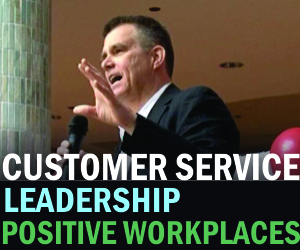 Customer service training can give people confidence in dealing with difficult people or situations. All of these things are essential for creating outstanding customer experiences, and they directly impact customer retention and profitability. But they aren’t the things that help people go the extra mile. Because the extra mile is not about what you do, but why you do it. The extra mile is you. There was a fantastic example of going the extra mile just this week at a McDonalds in Morgantown, West Virginia. One of the employees, Melissa Fichtner, shows up to work every morning with a new set of jokes to share with her customers at the drive-thru. Why? Because “Everybody deserves to be happy,” she says. Going the extra mile in customer service all boils down to one thing – caring. Ms. Fichtner wants to make people smile. She wants people to be happy. She wants to make a positive difference in other peoples’ lives. That can’t be trained. It has to come from you. One thing is for sure, though: the people of Morgantown, as well as McDonalds, are very fortunate to have such a wonderful person in their lives. If you care about customer experience, this is ‘required reading.’ Find out why people are raving about The Journey to WOW!